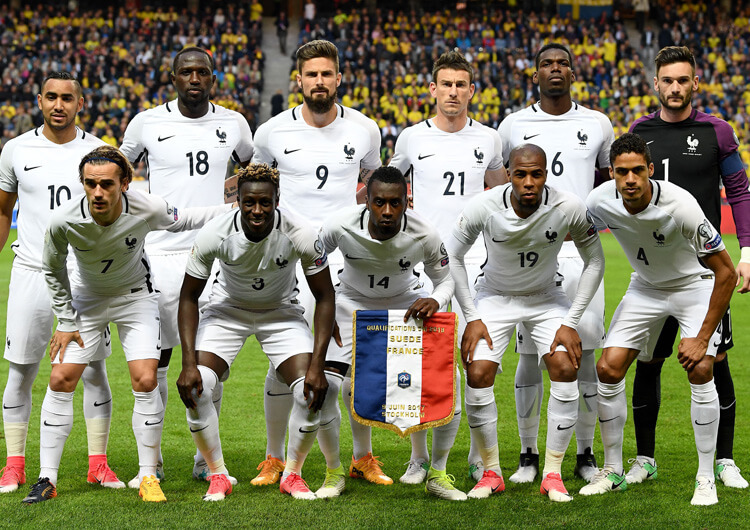 France will almost certainly name an unchanged team from that which started their semi-final victory over Belgium. That means a 4-3-3 formation, with N’Golo Kante, Paul Pogba and Blaise Matuidi once again providing Didier Deschamps with a physically formidable presence in midfield. Tactically, France will no doubt look to utilise the significant talents and express pace of Kylian Mbappe against Croatia left-back Ivan Strinic, while also looking to dominate possession by stretching the pitch and using full-backs Benjamin Pavard and Lucas Hernandez to provide most of the width beyond Mbappe. 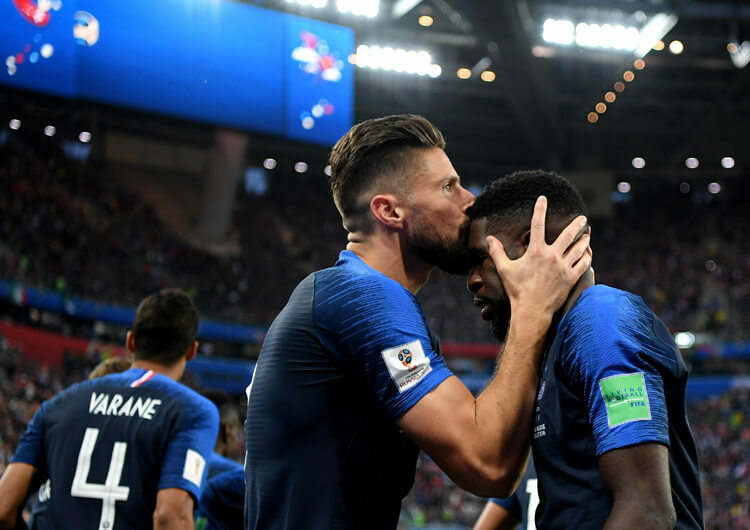 This allows Matuidi and Pogba to operate between the lines, from where the quality and range of Pogba’s passing in particular can look for runs in behind from Antoine Griezmann and Olivier Giroud. Assuming Ivan Perisic has recovered from the thigh injury he suffered in the semi-final win over England, Croatia will also name an unchanged team. Should the Inter Milan attacker not make it, Mateo Kovacic could join Ivan Rakitic and Luka Modric in the middle, with Marcelo Brozovic pushing higher and wider. Andrej Kramaric could also come in to play wide as a direct replacement for Perisic, or up with Mario Mandzukic – as the team sometimes lined up during World Cup qualifying. Tactically, Croatia will look to make use of the wide areas and direct play. 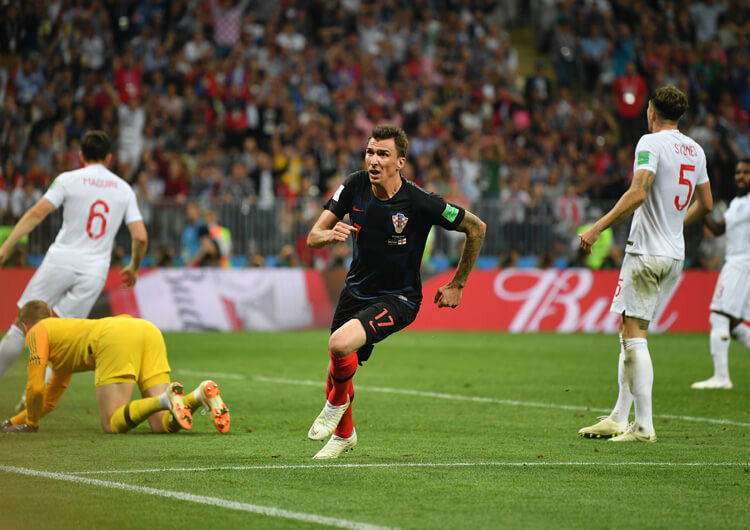 France have demonstrated that they are very hard to play through, so it would seem likely that Croatia will need to target specific areas and methods; this could include dropping Modric or Rakitic deeper and having them play directly to Mandzukic, or in behind for Ante Rebic or Perisic. It may also be worth keeping an eye on the relationships between Sime Vrsaljko and Rebic on the Croatia right, and Strinic and Perisic on their left – any space not covered by France’s midfield three on either side could be a potential weak spot from which Croatia can create chances. The midfield should provide a fascinating battleground on which control of the World Cup final will rest. 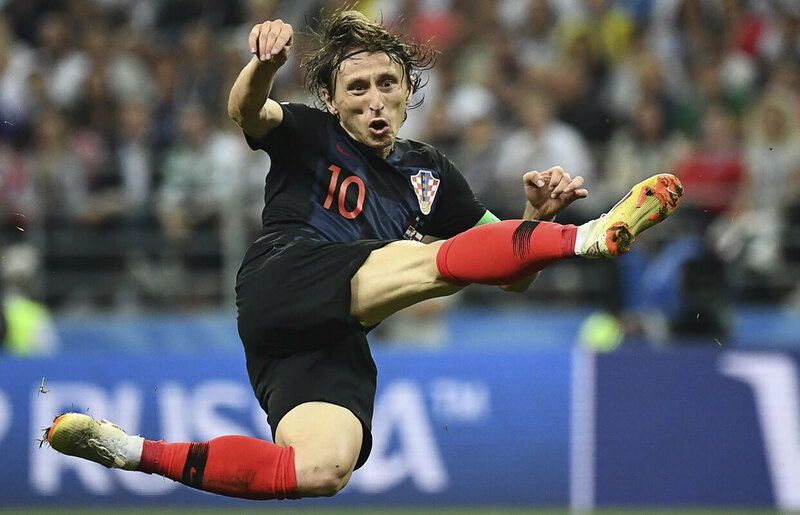 Croatia’s midfield three of Golden Ball contender Modric (below), Rakitic and Brozovic have technical superiority in this area, but France have a physical advantage with their own superb trio of Pogba, Kante and Matuidi. Both sides will likely have comfortable spells in possession and play against a mid-block for large parts of the game, so it would not be unreasonable to expect to see these players dropping in to the defensive line to get on the ball – most commonly Kante for France and Rakitic for Croatia. While it is reasonable to suggest that whoever wins the midfield battle for control will likely have the best chance of winning the game, it is just as easy to think that they may simply cancel each other out – in which case, the game may be won elsewhere. Potentially a match-deciding duel that could have a major impact on how Croatia set up. If Strinic is involved in Croatia’s attacks, then it will leave him and his left side very vulnerable to a counter-attack; if Strinic doesn’t get involved, then Croatia have one less player available to break down a substantial French block. 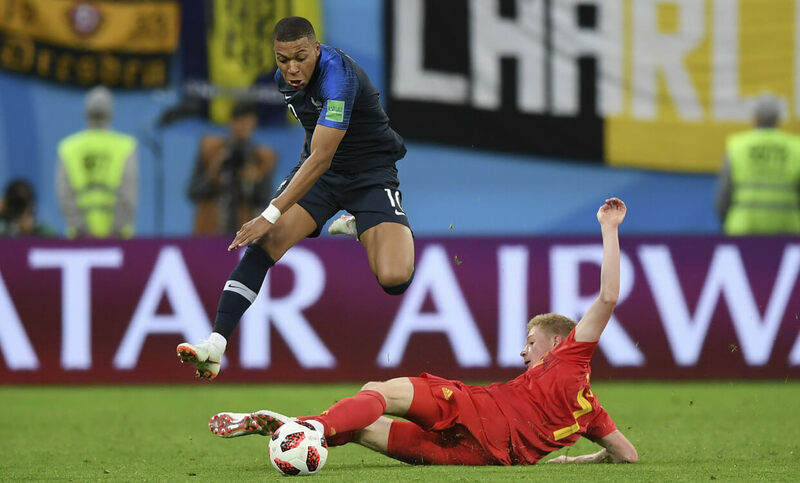 We can expect to see Golden Ball favourite Mbappe (below) running at and in behind Strinic as much as possible in this game, particularly as Croatia have played now played three consecutive 120-minute matches. France, by contrast, haven’t been to extra time once. It will be crucial to Croatia that this battle is seen as a two-on-one. Vrsaljko (below, left) was superb in the semi final against England – a constant threat going forwards and linking with Rebic against England’s midfield three and left-back. 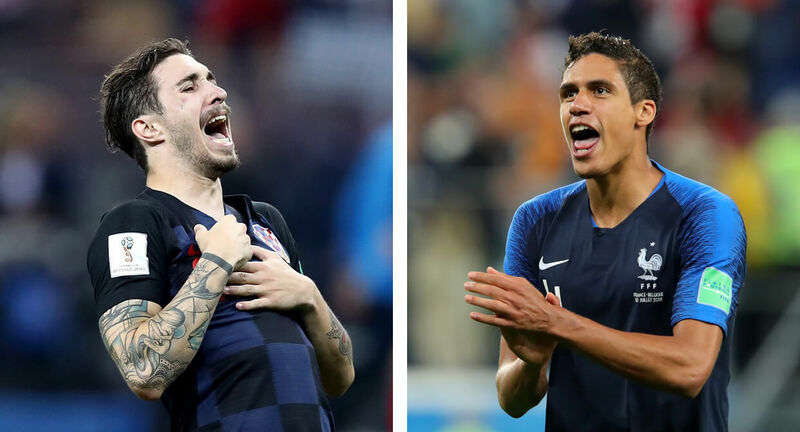 As France often leave three players up, Vrsaljko’s involvement will likely attract the attention of Matuidi and/or Kante, as well as left-back Hernandez. In doing this, more space could be created in the middle for the likes of Modric to get on the ball – or there could also be the potential for an early cross for Mandzukic from these areas. The aerial duel between Mandzukic, Croatia’s matchwinner against England, and Varane, arguably the best defender on show in Russia this summer, will likely decide whether Croatia are able to seriously trouble France or not. If the Juventus forward is winning the duel, then France will need to ensure they stop the supply to him at source. Real Madrid centre-back Varane (above, right) will need to be wary not only of the aerial challenge, but also of Mandzukic’s ability to get across or in behind him. France are not a side that change regularly during a game – Didier Deschamps’ earliest substitution in a knockout game in this tournament has been in the 75th minute. If they are protecting a lead late on, don’t be surprised to see Sevilla midfielder Steven Nzonzi on for one of the front three. If they are chasing, Liverpool target Nabil Fekir would be a likely replacement for one of the deeper midfield three (most likely Matuidi). Corentin Tolisso, who stepped in for the suspended Matuidi in the quarter final against Uruguay, is another alternative in there. Croatia head coach Zlatko Dalic is more likely to make changes. Fiorentina midfielder Milan Badelj is usually seen at some point, either to help protect a lead or to help Croatia stay in the game if they are being overrun. Kramaric is another who has been seen plenty, albeit further forward – he offers an alternative threat to give opposing defences more to worry about, while also freeing Mandzukic up a little. If Ivan Perisic is able to start, that also gives Dalic the option of Real Madrid enforcer Mateo Kovacic from the bench too.